As far as I can tell, the sick leave override was almost a complete party line vote in the House of Delegates. Dels. 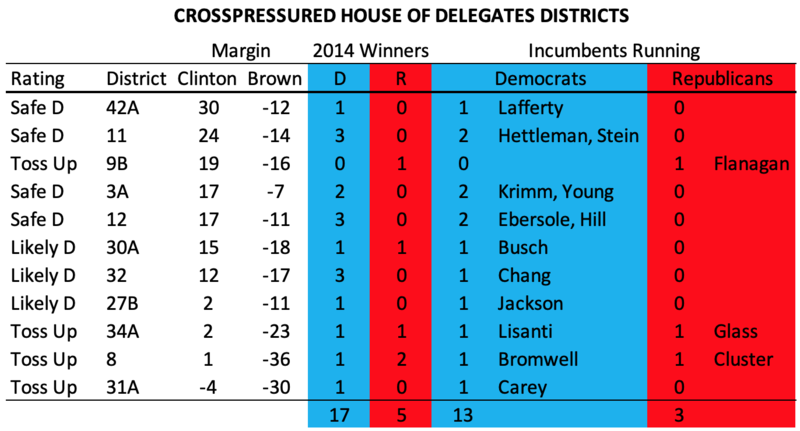 Eric Bromwell (D-8) and Ned Carey (D-31A) were the only Democrats who voted no. Interestingly, Del. C.T. Wilson (D-28) was recorded as absent but initially voted no according to a legislator on the floor. The Senate was more suspenseful but it turned out that the Democrats had one vote to spare. Just three Democrats – Sens. Jim Brochin (D-42), Ed DeGrange (D-32) and Kathy Klausmeier (D-8) – voted with the governor. Brochin and Klausmeier represent Baltimore County while DeGrange hails from Anne Arundel. This year, Brochin is running for the Democratic nomination for Baltimore County Executive. Klausmeier is locked in a fierce reelection battle against Del. Christian Miele in her Baltimore County district. It voted for Hogan by 36 points but for Trump by less than 1. Bromwell represents the same turf. In Anne Arundel, DeGrange has already announced his retirement from the Senate. His district went for Hogan by 17 but for Clinton by 12. Del. Pam Beidle, who is running for the Senate vacancy, voted to override Hogan’s veto in the House. Carey represents a more Republican leaning slice of Anne Arundel that went for Hogan by 30 points but gave Trump just 4% more than Clinton. Wilson represents increasingly safe Democratic turf in Charles County – it went for Brown by 4 and Clinton beat Trump by 23 – so his flirtation with voting no would not have been due to reelection concerns. All other legislators from his district voted to override. Despite the few defections by Democrats in both houses, party trumped any fear of Hogan. Increasingly, Democrats are betting that the political landscape in their district will resemble 2016 more than 2014. Even though Hogan will undoubtedly do better than Trump, his ability to pressure Democrats into agreement appears limited. 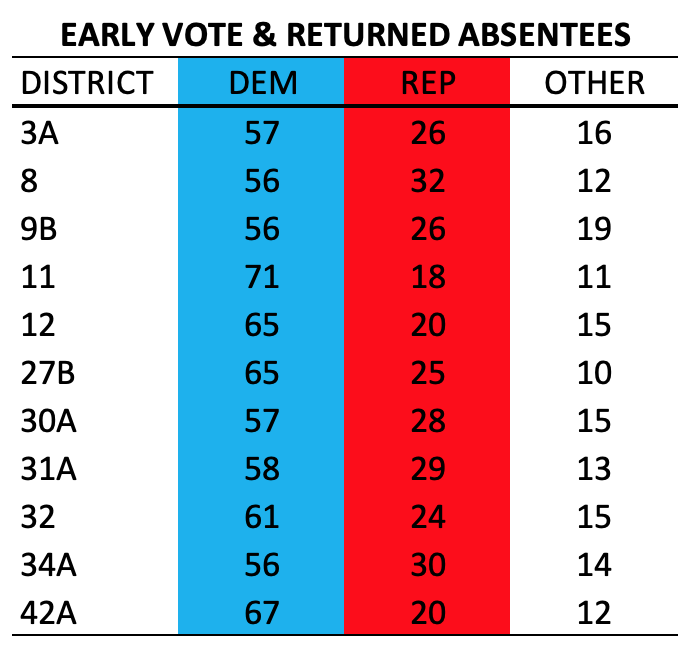 Continuing our view of the lay of political land in advance of the 2018 state legislative election, 7S turns to vulnerable Democrats in the House of Delegates. We start today with the one sitting Democrat rated as a toss-up. Delegate Ned Carey is in the unenviable position of holding the most endangered Democratic seat in the House. Located in the Brooklyn Park and Glen Burnie sections of northern Anne Arundel County, District 31A is a single delegate subdistrict that contains the more Democratic territory in very Republican District 31, which should just be renamed Simonaireland. The father holds the Senate seat and his daughter is a delegate from 31B. Carey represents the only Democratic House district carried by both Larry Hogan and Donald Trump. District 31A went for Hogan by a 30 points in 2014. While Hillary Clinton fared far better, she still fell 4 percent short of defeating Trump. A former school board member and BWI executive endorsed by the Baltimore Sun, Carey had the advantage of facing an inexperienced Republican challenger, Terry DeGraw in 2014. A poor fundraiser, DeGraw spent little on her campaign. Her three general election campaign finance reports show she spent a total of $13,952.74. In contrast, Carey spent an impressive $84,613.07 to win the seat by 5.3% over DeGraw. Besides loaning his campaign $10,000, Carey received $47,000 in donations from the House Democratic Slate, as well as another $2000 from Sen. Ben Cardin’s PAC and $2500 from former Gov. Martin O’Malley’s O Say Can You See PAC. The Republican lean of the district combined with his small victory despite outclassing his opponent in fundraising and experience paint a big target on Carey’s back for 2018. The Republicans will have a real shot if they can find a good candidate and fund them well. The best evidence that Carey will nevertheless not lose easily is that he won in 2014, despite it being a truly hellacious year for Democrats. In an election when long-term Democratic legislators in similar territory went down, Carey managed to win the seat. No doubt he is hoping for a more favorable climate in 2018.